Sizzling Gold and Sizzling Hot 6 Extra Gold are two different slots. Most sites lack the necessary experience to distinguish between the two, but they are not the same games. In this slot, everything is golden and highest paying symbols are the golden sevens. Lower paying symbols are watermelons, plums, stars, grapes. cherries, and strawberries. The original fruity setting was kept along with the number of reels. 5 reels and 3 rows just like in the traditional Sizzling Hot. While being different mostly visually Sizzling Gold is still a brilliant slot machine game. It was released by Novomatic on 2/3/2015 along with other games. While most sizzling slots have a red theme with fire and flames Sizzling Gold stands out with the orange and golden colors used in the background as well as in some symbols. The 5 win line or pay line system was unchanged. The highest winning symbol, the Golden Seven can now enable adjacent wins. This simply means that the Golden Sevens don't necessarily have to be from the left reel to the right to constitute a winning combo. This can be appealing especially for experienced slot players since they can better recognize the winning potential in this. The platform used is Coolfire II-s. Sit back, relax and play Sizzling Gold online for free. Try out all the features and grab those golden sevens to maximize wins. 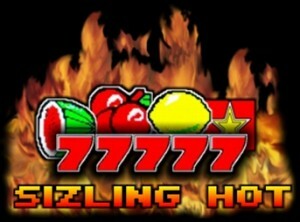 This 5x3 slot machine with fruits and sevens has an RTP rate of 94%. A more favorable number would be 96-97% but compared to local slot machines which are in best cases 80% is still a big deal. This free version may not be available outside the European Union. Set the bet for each fixed line then spin the reels. The paytable screen reveals all winning combinations. Getting 3 symbols of the same kind from the left reel to the right constitutes a winning combination. Wins can be doubled by the Novomatic's famous double or gamble system. When activated by the player a game of guessing starts. The player must guess the right color of a face-down card. A correct guess results in doubling the winnings. Not guessing right means losing the winnings. The original version is available at licensed GreenTube sites. This means any site in partnership with Greentube will have the game. We recommend playing at Videoslots mostly due to their positive reputation and the extra content they offer to players. Extra content in the form of special events and promotions. Seasonal prizes and tournament opportunities. Quasar Gaming is another option for residents of the European Union. The attached video shows clearly what sets Sizzling Gold apart from the older 2008 version. The simple and player friendly elements were kept and the rest is just mostly a visual update or rework that was generally well received. The choice of including gold makes perfect sense since a shiny object goes well with winning. And Novomatic's Sizzling Gold slot is all about winning.